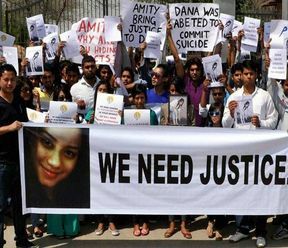 New Delhi/Shillong, May 7 : The north-eastern community along with other students of Amity in Delhi has strongly reacted to the mysterious death of Dana Sangma, a student of Amity University from Meghalaya, who committed suicide after allegedly being mistreated by college authorities. Considering the matter as grave concern of discrimination and racial-profiling, friends and family of Dana Sangma met Meghalaya CM Mukul Sangma to refute the claims that Dana was using cellphone during exams. Dana Sangma was pursuing an MBA course at Amity and committed suicide after she was accused by her college of cheating. Earlier, Amity University had dismissed all the allegations that north-east student Dana Sangma was facing any sort of discrimination. Also, University had maintained that there was no discrimination of any nature on the basis of caste, creed, region or religion.